Hello and happy Tuesday. It's time for another challenge at CASology. 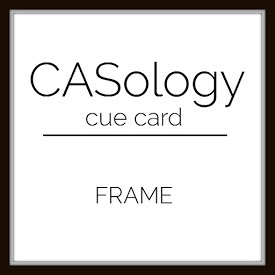 This week, our cue word is frame. I die cut a bunch of frames using a Keep it Simple frame die from PTI, and then just moved them around until I found an arrangement I liked. In order to make it look like the frames were interlocking, I cut some of them frames where they intersected and put the cut edges underneath. 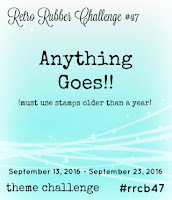 I am also linking this card up at Simon Says Wednesday Clean and Simple challenge and Retro Rubber #47: Anything Goes. I only used 1 stamp on this card, and I believe it is about 3 years old (CAS-ual Fridays Bold Wishes). Now, it's your turn. How does FRAME inspire you? I hope you play along this week. Please remember to keep it Clean and Simple. Our guest designer is Ohhh Snap. Well what can I say else that I love it!! It's gorgeous and I love your style! This really is gorgeous, Joyce! Love the way you wove the frames together! Love it! Bold, bright and really eye catching! Your placement of the frames created a very cool geometric effect, and I love all the bold colors! Awesome card, Joyce! What a cool card Joyce!! The interlocking frames are fun!! What a fun card, I love the design. Joyce, I love this frame card, the interlocking frames in all of those fun colors really look amazing. Thank you for sharing with us over at RETRO RUBBER, hope you join us again soon. Joyce your frames are perfect for the challenge, love them is all those bright colours!! Fantastic design and I love your color choices! Love your interlocking frames! Perfect for the challenge! LOVE your interlocking frames - BOLD yet CAS! Great card!! 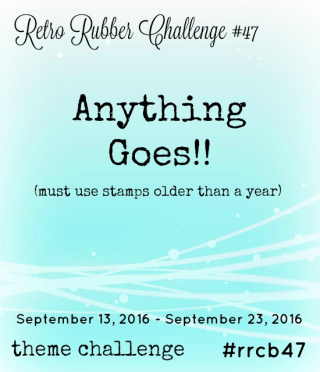 Thank you for playing along with our challenge at Retro Rubber and hope you will join us again soon. I always try to think of an idea before looking at the DT's cards Joyce and you've pretty much nailed the design I had in my head lol. Looks amazing in the bright colours! Back to the drawing board! Love the interlocking frames and the fun colors in this card, Joyce. Great card for your combo challenges. Thanks for mentioning the age of your stamp and we hope you will participate with Retro Rubber often. Love the interlocking frames - such a fun idea! Very clever Joyce! I love the retro feel with those frames! Very striking design! Thanks for playing along with us at Retro Rubber! Joyce, you have an amazing eye for color and design! If I attempted that it would look like I spilled the frames on my card accidentally. Yours? Perfect, perfect! Superb framing!! I am pretty sure my brain would not have managed to create this! So very cleverly done, and as usual, I LOVE your combo of colours, Joyce!! Hey Joyce!! I love all of those frames! Super pretty and fun.